Even if you can get used to the awkward controls, Star Fox Zero is merely mediocre. It’s as disappointing a major Nintendo console release as there’s been in some time. You’re Fox McCloud himself, once again the pilot of your very own Arwing fighter, flying or, on rare occasions, driving a tank, through missions in a sci-fi adventure.. You swoop through battlefields and past obstacles, tracking and shooting down swarms of enemy tanks, planes, missiles, mechanized spiders, giant space birds and the like along the way. The game’s core concept is that a futuristic fighter pilot doesn’t just have hands and eyes but also a neck that turns their head. A real, futuristic fighter pilot might use their hands to move a flight stick, which tilts and turns their jet. They might turn their neck to look around in their cockpit and notice the position of targets next to them or above them. The designers of Star Fox Zero have decided to let players do all of that, theoretically giving them more control than they have ever had in a Star Fox game. Star Fox Zero’s most obvious problem, though, is that its designers at Nintendo and Platinum Games executed that good, core idea poorly, thanks to some combination of hardware limitations and odd design choices. It’s not easy to explain what is wrong with the game’s design, but, given that I humbly think I’ve solved Star Fox Zero’s controls, please bear with me. First, observe the game’s odd approach to two-screen display. As you play the game, the TV shows a traditional external view of your Star Fox Arwing. The GamePad screen displays your pilot’s view from the cockpit. The hands of your in-game pilot, Fox McCloud, are mapped, uncontroversially, to the left analog stick of the Wii U’s GamePad. This allows you to maneuver Fox’s craft up and down, left and right, as he blasts through battlefields. It will also move his targeting reticule a bit, helping you draw a bead on some incoming enemies. The input for moving Fox’s neck (and head) is what makes this scheme awkward and frequently unpleasant. His neck is controlled with tilts of the Wii U GamePad. 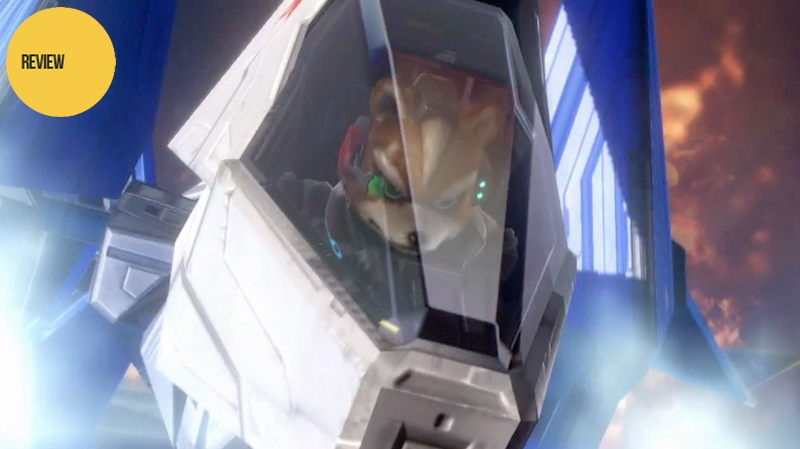 In theory, Fox is sitting in a glass bubble of a cockpit with an unobstructed view of what is above and below him. Tilt forward with the GamePad, and he will bow his head to see the battlefield below him. That bottom-looking view will appear in the GamePad, even as the TV will still display what is in front of Fox’s Arwing. Tilt up, and the GamePad will see what is above Fox. Tilt left or right, and he is craning his neck to see an enemy who has flown past him. This is how it works in the game’s tank sequences, too. This is the kind of enemy designed to encourage you to use the GamePad to tilt Fox’s head back for better targeting. As you play the game, enemies will enter your field of vision. You can try to shoot them down while looking at either screen. The targeting reticule appears on both displays, and your lasers will fire wherever it points. Enemies are seldom simply in front of you. To make the most of the neck option the game will frequently put targets above or below you. Picture flying toward a tank on the ground that has a weak spot on the roof. You’re expected to fly over it, tilt Fox’s head down and shoot the roof. The game sometimes produces big spider walkers that you have to fly under, requiring you to rock Fox’s head back to shoot at the weak spots on their undercarriage. In theory, this is all fine, but the controls too frequently leave your aim askew or leave Fox’s vehicle vulnerable to being blindsided. Any motion-control scheme requires not just that the controller responds to the twists and turns of a player’s hands but that it’s easy to set things back to a resting, zero position. Without that easy ability to return to zero, you’d be playing motion-controlled Mario Kart and never be able to get Mario to stop turning and drive straight. In Star Fox Zero, not getting back to a zero resting position will keep you from being able to shoot straight, which turns out to be an all too common problem. As I played the game, especially in the first few days that I had it, I found that the GamePad’s resting point seemed to wander as I tilted it. You can press in on the left analog stick to instantly recalibrate and recenter it, but then the zero point of the motion controls will be tied to a physically tilted GamePad position. Instead, I usually tried to use my hands to level the controller back to a default, zero position. I usually had to do that just by feel, since I was looking at the TV half the time. It’s not as easy as it sounds, because of how the controller’s sensor wanders and because the TV view doesn’t give much indication, if any, about the position of Fox’s head. If you look down at the GamePad screen to check his view and to be sure you’ve straightened out, you now have the problem that you’re not seeing whatever might be on the verge of colliding with your Arwing from the side. That’s something you could see if you were looking at the TV. I wrestled with Star Fox Zero’s controls for days, because I liked the idea of omnidirectional aim and peripheral awareness that are behind them. I was sure that I could develop the dexterity to make them work. I kept failing. A few days into struggling with the game, I tried switching views. I put the cockpit view on my TV and the external ship view on my GamePad. It was no better. And then, I figured it out. I figured out a better way to sit and a better way to hold the controller while playing this game. Folks, I don’t like to brag, but I think I solved Star Fox Zero’s controls. The secret was to use my leg. Consider this the missing page to Star Fox Zero’s instruction manual. If you are playing the game, sit down, stretch your legs, and lift them onto an ottoman or chaise lounge or even the back of a large and motionless dog. Pull one foot in, making a peak with your knee. Hold the GamePad in your hands, and brace the side of one of your hands against your knee or upper thigh. Make sure the GamePad screen appears to be just below the TV screen beyond it. If there is a way to play Star Fox Zero with power, this is it. Because you are bracing the GamePad against your leg, you will mostly be able to keep it still and not mistakenly trigger its motion controls. If you do look down and tilt the controller to take out an enemy below you, you’ll be able to get back to a default position without even looking at the GamePad by using the feel of your hand or controller against your leg to orient things. You will also easily be able to swiftly glance from the TV screen to the GamePad, maintaining peripheral vision of one while looking at the other. You’ll never be flying blind. In your reclined pose, you will be a success. Once you correctly grasp the game’s controls, you can proceed to play a Star Fox game that unfortunately feels unfinished. There is no brilliant game hiding beyond the awkward controls. There is a mediocre one. Zero is saddled with dull level design that is passable but far below expectation, not just for Nintendo but for their partners at Platinum, who’ve long specialized in offering games of uncommon, memorable spectacle. Star Fox Zero plays as a loose remake of 1997's Star Fox 64. The Nintendo 64 game, like the original Star Fox on Super Nintendo, put you in on-rails missions that moved forward on their own. It also threw Fox and the rest of his squadron into arena-shaped free-flight missions that focused on dogfighting. The Wii U game does the same thing, mixing auto-scrolling and free-flight levels. The N64 game mostly put you in an Arwing fighter jet but also let you drive a tank and a submarine. The Wii U entry is mostly Arwing, but also offers missions involving a tank or a hovercraft. Zero borrows some level designs from the 1997 game, though sadly, the UFO and train battles don’t return. Zero’s designers had their own ideas, but they mostly amount to unmemorable battles over generic battlescapes. Throughout the game Fox’s wingmen Falco, Peppy and Slippy repeat familiar lines from the N64 game. Veteran players will feel like they’ve done all this before and had more fun doing it back then. New ideas in Star Fox Zero include the ability to transform the Arwing into a walker and a new hovercraft that drops a little, tethered robot that you control with the GamePad and use to collect coins or hack open locked passageways. The walker is lightweight and awkward to control. The hovercraft-robot combo is just boring. None of it is special enough to feel worth the formidable barrier put up by the game’s controls. The new Gyrowing hovercraft drops a little hacker robot whose perspective is shown on the Wii U’s GamePad screen. The sum of Star Fox’s levels is at least greater than the parts, since the game brings back the branching level concept from Star Fox 64 and makes a minor puzzle out of figuring out how to find the alternate exists to some of its levels. The Nintendo 64 game, like this Wii U one, was designed for distinct, single-sitting playthroughs that lasted only an hour or two but varied based on how you navigated the branching sequence of levels. Some of the game’s missions had multiple end states, allowing skilled players to branch off toward more interesting levels or to take surprising shortcuts. Star Fox Zero’s branches lead to more interesting skirmishes than what you’ll find on the default path, but there unfortunately just aren’t that many levels with alternate exits to justify the lackluster mission-specific design. (A display in the game’s unlockable no-continues Arcade Mode shows how many branches there are, so click here if you want to see). After you initially beat Star Fox Zero’s final boss in a single-sitting playthrough, the game frustratingly flirts with the concept of reconfiguring its levels. Some early levels become accessible with different Star Fox vehicles and flow very differently. A slow-paced level initially navigated carefully with a hovercraft, for example, becomes a rapidly-scrolling mission flown through with an Arwing. The remixes are good. Unfortunately, only a small number of the game’s early levels get these alternate designs, making this promising aspect of the game’s level design feel abandoned halfway through. Ultimately, Star Fox Zero’s biggest problem is that its weak level design and flawed controls smack of a game that was designed less through the spark of creative inspiration and more with the intent to justify the unpopular and unconventional two-screen Wii U console. The game was first presented to reporters at a small press showcase at E3 in June of 2014, where Nintendo’s brilliant game designer Shigeru Miyamoto showed off a trio of experiments for a console that was a year and a half old and flailing. Back then, the Wii U badly needed its equivalent of a Wii Sports or Nintendogs, games that explained the utility of other oddball Nintendo gaming machines in ingenious, popular ways. The experiments Miyamoto presented at that showcase used game designs that required a console that had a separate screen in its controller. One was bad: the clumsy Project Giant Robot that let you see through a big robot’s eyes while steering him through a city that was shown on the TV joined the likes of Tetra’s Trackers and Donkey Kong Plus as a Nintendo game concept that never got past E3. One was good: the inspired surveillance-baced tower defense game Project Guard evolved into the terrific Star Fox Guard. And then there was Miyamoto’s Star Fox concept, which back then was just that hands-neck control scheme. It would take some time to get used to, reporters were told then. The demo had potential, sure, but it seemed a little off. Nearly two years later and after a sizable delay from its planned November 2015 release date, the results are, at best, okay. The split view feels like a half step toward a design that would have worked better, perhaps, if played through a virtual reality headset that could map the fighter pilot’s neck to a player’s actual neck. Even after I found a way to wield its unwieldy controls, the game underneath those controls is a lukewarm retread. As a flagship Nintendo console release or even as a worthy sequel to a once-great franchise, Star Fox Zero just doesn’t cut it.